Salvation And Survival: They Would Sell Our Rights Cheap! They Would Sell Our Rights Cheap! As is my usual custom, I grabbed a quick lunch before getting back to my writing, and sat down to watch a few minutes of Fox News to see what they deemed newsworthy. I wasn't surprised to find that Megan Kelly was steeped in the "story du jour" of the kidnappings in Ohio. I almost dropped my sandwich when I heard her asking an Investigative Attorney if it wouldn't have been prudent to have gone door to door in that community and searched every basement, garage, and attic --- especially when you looked at the circumstances, and all the evidence was laid out and authorities realized that three girls had all gone missing from the same neighborhood. She then pointed to a map on the screen that showed the proximity of each girl's home within a several block area. "Wouldn't that have been enough to conduct a house-to-house search?" she asked. "I mean, I know we have a Fourth Amendment, and that is not likely to go anyway anytime soon, considering where we are as a country today...". As her dumbstruck guest picked his jaw up off the floor, he very calmly informed her that the police could not enter any house without permission, or a search warrant and probable cause. Ms. Kelly then tried to cover her tracks by explaining, "Of course, we don't want the police just coming into our homes anytime they want ... after all, we still have the Bill of Rights". Wait! Didn't you just say they should be able to do just that, based on a hunch and a map? It was such a blatant smack-down of our Fourth Amendment rights and quite acceptable to this Elite so-called "journalist". She seemed to imply that "where we are as a country today", in terms of those very Rights, was subject to change, and in reality, probably should change. I mean, how will we ever be able to protect all the future sixteen-year-old Amanda Berrys if we can't trample on everyone else's rights in the process? This is the same logic -- and the same type of newscaster -- who didn't bat an eye when the fully militarized SWAT teams shut down Boston as they intimidated homeowners in their search for the Marathon Bombers. House-to-house searches were done, in total violation of the Fourth Amendment, and under the guise of "protecting the populace". So I have to ask myself, "Why would the common folk of Boston and an Elitist like Megan Kelly both be willing to forego 'the right of the people to be secure in their persons, houses, papers, and effects, against unreasonable searches and seizures....' as affirmed in the Fourth Amendment to the Constitution?" I guess the good people of Boston have forgotten their history. 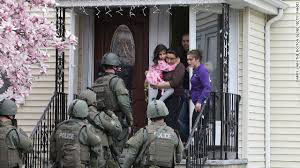 Warrantless searches have long been a bone of contention, going all the way back to the Revolutionary War when agents of the British Empire conducted warrantless searches on homes of colonists, which was viewed as an abuse of power. The idea of personal liberty was so dear, that our ancestors would never have traded their right to protect themselves or their property for a suggestion of safety. Yet we saw modern day Bostonians never even question the government's access to their homes. And it's my guess that Megan Kelly doesn't have a problem with warrantless searches as long as it happens to the "little people"; after all she is upper class and her social strata would have no reason to fear such mistreatment from authorities. It's alright for the "ordinary" citizen to be subjected to this infringement on their rights if it removes the lowliest from their midst. Are we really that blind to the subtleties of tyranny? Our Bill of Rights is what makes us more than mere serfs to a lord and master. It stands between us and an over-reaching, authoritarian government. 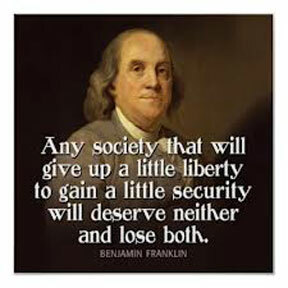 And I would remind all Americans of this famous saying by Benjamin Franklin: Those who would give up essential liberty to purchase a little temporary safety deserve neither liberty nor safety. And unfortunately, I fear that's exactly where we are headed ... we will allow our personal freedoms to be dismantled, bit by bit, as the militarization of our law enforcement grows and the talking heads convince us "it is for the good of all". Ms. Kelly couldn't quite camouflage her bias. And neither can I. So I ask you, "Considering where we are as a country today, will you forfeit your God-given liberties for the fickle promise of security by the State?" If not, then know your rights and be prepared to defend them. If you don't safeguard them, no one else will! Psalm 122:7 Peace be within your walls and security within your towers! Ben Franklin hit it right on the head! I was surprised when remarking to a friend, who is president of a local bank, a few years back about the patriot act. I quoted Ben Franklin then, his response was, "what a different world we live in". Seems values and principals have become "different". God help us! Old fashioned, Christian values are nearly extinct. We are quickly becoming and endangered species. With the liberal values now being put in place, what are our children and grand children going to face? I hope Jesus returns before then. And what is disturbing to me is that Americans are willingly accepting these "different" values and principles. No questioning, no fighting back; just going along willfully. I, too, am ready for Christ to return!